What if Don McLean was wrong and the music didn't really die? What if the spirit of the music that inspired rebellious young America in the 1950s survived underground all these years, with musicians meeting at late-night jam sessions to trade licks and tell stories, the old guys showing the young guys how it's done, while mainstream commercial music marched ahead? If that happened, you would hear music that is vibrant and energetic, you'd see people doing the bop and shaking it for all it's worth on the dancefloor, you'd hear some old songs but they wouldn't be dragging you back to re-live the past, they'd be forcing you into the present, challenging you to live your life at full speed right now! You would hear The Colliders. 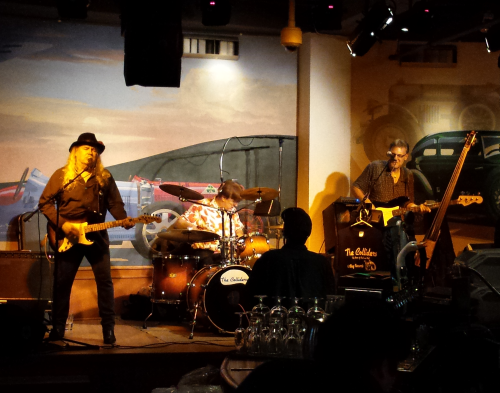 The Colliders are Jim Kennedy on guitar, Hank Burnett on drums, and Bill Enderlin on bass, three guys who have played a whole lotta years, if you added them up. They've done the Top-40 gigs, they've recorded and hustled original songs, played the concert halls and the honky-tonks, they've fronted bands and played behind other people, and now they are lucky enough to play the music they love. The material is classic rockabilly, blues and honky-tonk from back in the day, mostly rockabilly-ish tunes with a big beat. Most of the songs date back to the days before the Beatles showed up on Ed Sullivan, back before guys in suits figured out there were millions to be made out of this rowdy noise the kids called "rock and roll." Back when the music was real. Be a fan - click "Like" on our Facebook page for updates and news, not too often, always informative! The Colliders have a Jango radio station. You can listen and comment -- leave us your email address if you like what you hear. -- Hey, speaking of Jango, click HERE to read the comments people have left for us at our Jango channel. We also recorded a few songs for a demo in 2008 to give you an idea about the kind of material we do. To get in touch with The Colliders, email TheColliders at Yahoo dot Com (that's a clickable link). The Colliders' Second 7-Song EP is out! 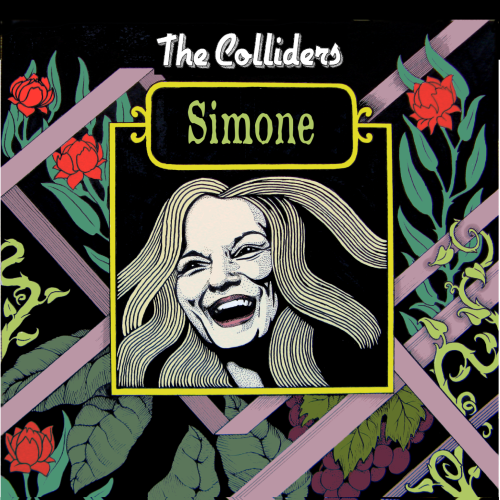 "Simone" features seven original songs written and performed by The Colliders, released in early 2016. On this second album the band expands into a diversity of styles and moods, developing the range of our sounds and bringing out the taste of what this band is all about. Material might be described as reaching from jump blues to swing, swamp-rock to sentimental ballads, rockabilly to blues, to grinding doo-woppy existentialistic nihilism -- you know, the kinds of music the band is known for -- but no song falls too neatly into a pigeonhole. Each song carries the special imprint of The Colliders in the performances as well as in the compositions themselves. We will be getting it on CD Baby and into the record stores. For now, you can pick it up at the show. 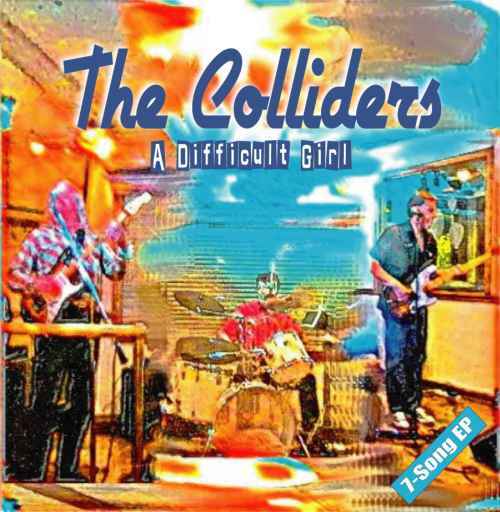 2011's "A Difficult Girl" featured seven original songs written and performed by The Colliders. Click on the image to go to CD Baby, where you can buy "A Difficult Girl." You can get the CD at Joe's Record Paradise in Silver Spring, Antone's Record Shop in Austin, Texas, and The Record Collector in Bordentown, New Jersey., or pick it up at the show. Now you can listen to The Colliders in your car or home, you can play our music at parties. The Colliders recorded this album at Big Beat Project Studio for CatBug Records, over the course of a year of Sundays. This is rock and roll like it was meant to be, and we are very proud of it.